iVend Mobile POS is a mobile point of sale extension to iVend POS for Windows – version 6.0 and above. iVend Mobile POS transforms an Apple iPhone, iPod Touch or iPad into a fully functional point of sale terminal on the go. Deployed with the specific objective of busting serpentine queues at the check out counters, iVend Mobile integrates the power and functionality of a traditional terminal POS into a mobile device that allows modern retailer to service customers anywhere on the shopping floor anytime. iVend Mobile enhances Customer Service, and enables store managers to spend more time on the sales floor, improving efficiency and profitability. iVend Mobile is available on iOS devices and select models of Android tablets. iVend Mobile is made available from the Apple App Store or Google Play and gets installed on the mobile device like any other App. User can either specify a fixed time during the day when the synchronization is to be executed OR the user can specify the synchronization frequency at which the transactional data from iVend Mobile will get synchronized to the iVend Server. The transactional data gets synchronized in real time whereas the updates from iVend HO server get synchronized at the defined frequency. iVend mobile POS license is based per POS terminal/ device and not per user. Each device can be configured to be operated by unlimited users giving a true multi-user usability platform. This means, you only pay for the software per device and not for number of cashiers working for your retail chain. iVend Mobile POS is configured like any other POS in the Management Console. 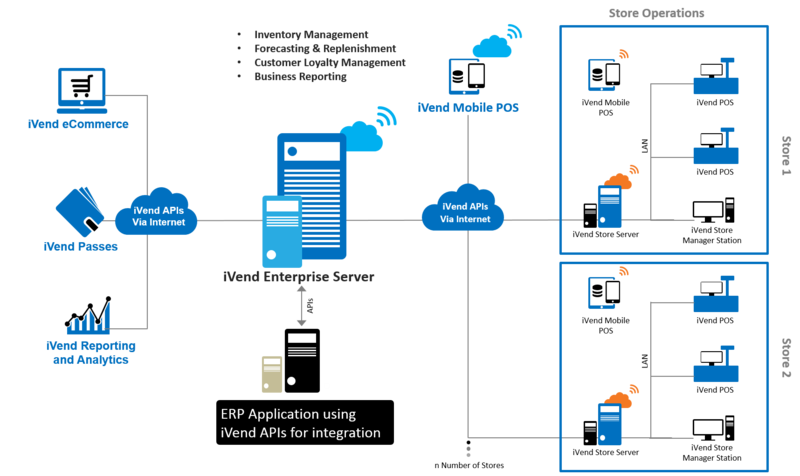 The connection of the mobile POS to the store server or the head office server is done through iVend APIs. iVend Mobile POS connects to the iVend Server over Wi-Fi / 3G / 4G / LTE using the iVend Mobile APIs deployed on the server side. iVend Mobile POS is design to work in on-line as well as off-line mode. In on-line mode the Mobile POS is perpetually connected to the iVend Server while in off-line mode the Mobile POS is functional without a perpetual connection (without network connectivity) to the iVend Server and can periodically synchronize data to the iVend Server over Wi-Fi / 3G / 4G / LTE.